Former top driver Henrik Jacobsen who raced in Formula Ford 1600 and Formula Ford 2000 established team FormulaSport back in 1991. Start: 1984 Debut in Formula Ford 1600, first race 6th place in a 13-year-old car. 10 in the championship. 1984: 10. In the Danish championship. 1995: Pole in the first race, but a year with accidents. 1996: 3. Place in the Danish championship. 1987: 2. Place in the Danish championship, 3 in the European championship. 1988: Danish Champion, 4 in the European championship, 2 in the Nordic championship. 1989: Only four races, and 2 wins, and third in the Danish championship. In 1989 and 1990 Went for F3 in England or Formula Opel Lotus in Euro Cup, but enough sponsorship were not available. 1991: I formed Team FormulaSport, as a semi prof. Racing team. 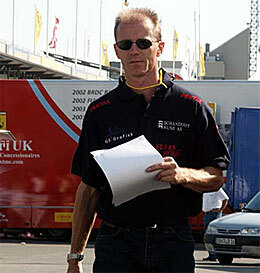 The team gave Jan Magnussen his debut in Formula Ford 1600. Raced with different drivers in 1991 and 1992. 1993: Team FormulaSport is now a full time racing team. With the driver Jakob Sund we finished 2 in the Danish championship, 3 in the Nordic championship, 9 at Formula Ford world Cup “Branch Hatch” in England . 1994: 2 in the German championship with Jakob Sund. 1995: 12 in the German championship with Michael Schröter. Winner of 1 Euro race. 1997: 2 in the German championship with Lasse Jakobsen.  8 with Thomas Serwin. 1998: 7 in the German Championship with Casper Elgaard.  2 in the Danish championship. 1999: German championship with Hanno Hess, and Philip Andersen  no result. 2000: European championship with Jarkko Venäläinen (FIN) best result 10 in France . 2002: 5 in the Danish championship with Mads Bo Nielsen.  1 win  2 second places. 2003: Scandinavian Formel Renault Cup. With Tom Pedersen and Kasper Andersen. Winner Tom Pedersen. 5th Kasper Andersen. 2005. No. 3 in the Scandinavian Championship with Micke Ohlsson (S).